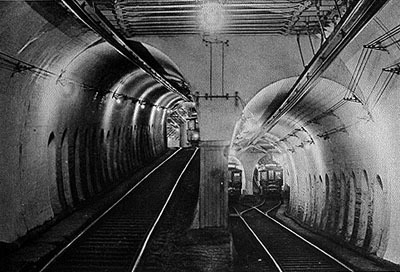 69 Park St. Station - Tremont Street subway - Boylston St. subway - Commonwealth Av. - Washington St. - Watertown Sq. 71 Harvard Stn. - Mt. Auburn St. - Watertown Sq. Streetcars: (horse-powered) 26 March 1856 - ca. 1900; (electric) 1 Jan. 1889 - today. Subway: 1 Sept. 1897 - today. Streetcars / Interurbans: 1435 mm. 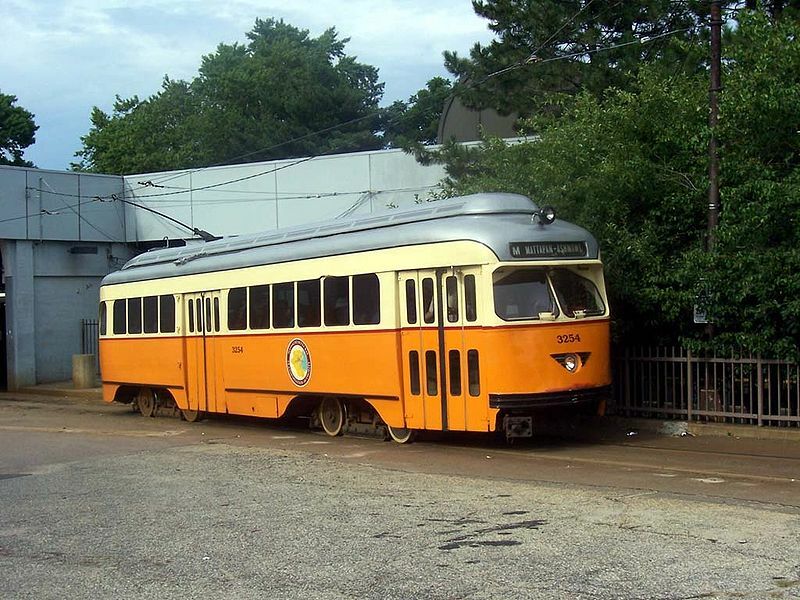 The Seashore Trolley Museum, in Kennebunkport (Maine), just NE of Boston, owns and operates historic Boston-area streetcars and subway vehicles, as well as many other vintage public transportation vehicles from around the world. Buckley, R. "No tea party in Boston" Tramways & Urban Transit, Dec. 2012 (75: 900), p.459-461. Clarke, B.H. Streetcar Lines of the Hub, the 1940s Heyday of Electric Transit in Boston. Boston: Boston Street Railway Association, 2003. Demery, L.W. "US transit funding - Part 6: Elsewhere in the USA (East Coast) [Boston]" Modern Tramway & Light Rail Transit, July 1990 (53: 631), p. 219-222. Kyper, F. "Tramways in Boston today - Part 1" Modern Tramway & Light Railway Review, Jan. 1968 (31: 361), p.11-16. Metropolitan Transit Authority (MTA). System Route Map. 1956. Pence, H. "Blizzard buries Boston" Tramways & Urban Transit, June 2015 (78: 930), p.226-230. 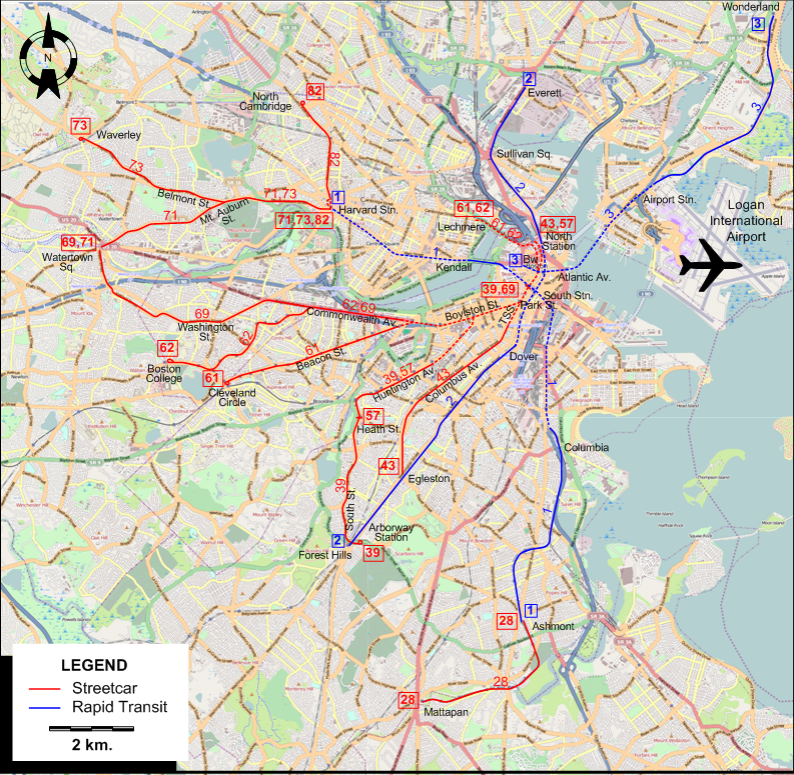 Simons, V. "Systems Factfile No.99: Boston, USA", Tramways & Urban Transit, Dec. 2015 (78: 936), p.488-492. Taplin, M.R. Tramways of North America, including rapid transit [Tramway Handbooks No.4] Hassocks (West Sussex, England): Light Rail Transit Association, 1981. Also, thanks to Jean Liou in France and Russell Powers from Denver CO for information on the history of the Boston system.